Weebly offers a simple iPhone app for its users to enable posting on the go. This is an easy to use and great time saving app for webmasters to create a blog post instead of opening Weebly site every time for small corrections. 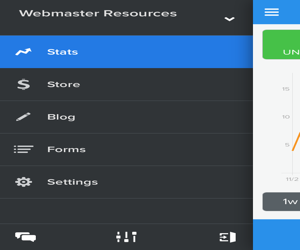 Weebly does not offer a complete site editing options within an app and only provides the features of blog posting and viewing site statistics. All the sites in an account are displayed in the app to view the detailed statistics. Every site has the options of viewing Stats, Store, Blog, Forms and Site Settings. Stats provides the detailed view of site traffic for various range of time periods for unique visitors and total page views. Clicking on “More Stats” option will display the Top Pages, Search Terms and Referring Sites similar to statistics offered in Weebly site. This is an useful feature for site owners to check the site traffic details on the hand very easily. “Form” option allows you to view submitted form entries and “Site Settings” offer you to switch on or off the notification for new blog comments and new form entries. “Store” option provides the overview of your online store’s settings and you can include a product and accept payments on the go. The main purpose of this app is to offer a platform for creating a simple blog and Weebly did this nicely. There are only four elements (Text, Photo, Video and Blockquote) available for you to create a new blog post. 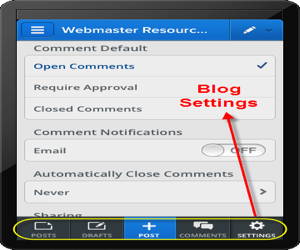 Complete comment management can be handled with “Comments” and “Settings” options. You can choose open, close or approval required options for comment posting and view, delete or approve the posted comments. You can also view and edit the posts saved as draft and the existing published posts. Blog posting offers you to upload images and videos within the app and the advantage here is that you can just upload photos from your iPhone or iPad Camera Roll or take an instant photo using the camera. The same can be done for uploading videos as well. There is an built-in image processing option also available to auto-fix and enhance your photos. 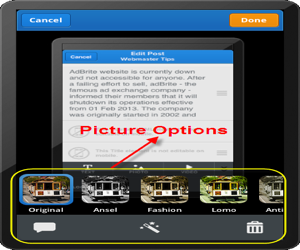 You can also add caption to your photo and delete the photo if you decide to remove it. App settings allows you to set the social sharing of your content on Facebook and Twitter. 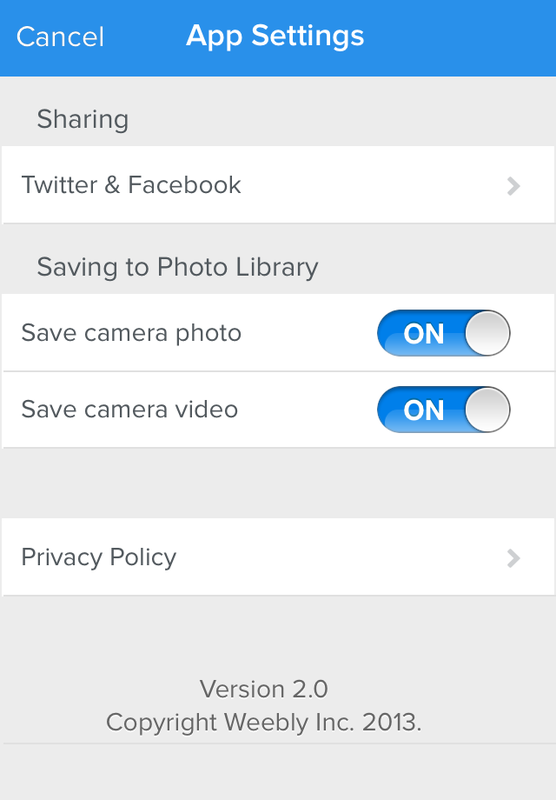 You can also set the options for saving photos and videos to your device photo library. 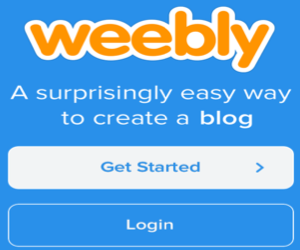 Weebly iPhone app helps site owners to publish posts on the go. Monitor statistics, comments and form submissions. Content publishing is not possible which makes the app less use for content site editing.